After what felt like forever of no progress, things are finally moving in the right direction with A Sour Chord. I got artwork back from the graphic designer who implemented all of the changes I requested and it looked amazing. To make sure I was really in love with it, I compiled the book into Kindle and iPad format with the artwork and put it on all of my devices. I then stared at it for a good three or four hours to make sure it really said what I want it to say. Turns out, it didn’t. The concept was the same, but we’re changing a bit of the minor details and should have it finalized by this weekend. Which means I’m one step closer to publishing. The price point. I’ve read almost every suggestion on the internet about how much you should charge for a self-published first time novel, and there’s really no right or wrong answer. I think that’ll come to me in the spur of the moment and I’ll just pick something, wait a couple of weeks and see how it goes. The description of the book. All three of the systems I’ll be selling through (Amazon, iBooks, and Barnes & Noble) allow you to provide a description of the book to help people know what it’s about. Writing that — without spoiling the book itself — is proving challenging. I’ve written four or five so far and will gather feedback from those that have read the book before picking one. It’s really interested to me to learn that the hardest part of this whole book writing process isn’t writing the book itself. The book just flew out of me, word after wild word, flowing from my fingers faster than my brain could process what I was writing. The first draft was finished in roughly four weeks back in April of 2013. Ever since then, I’ve been working on the harder parts; the editing, the artwork, the setup of the online services. I had no idea that so much went into this process, but I’m glad I’m learning. If this goes well and I go back to working on the second book, I’ll be a lot more educated on how this all works. I’m hopeful that this’ll all tie together in the end and I’ll have something to show for all of my hard work (and money spent) in the next month or so! I hope you’ve enjoyed this journey as much as I have! The graphic designer that’s working on the cover art for A Sour Chord emailed me a few tests last night to see what I thought of them. We went back and forth a few times about placement of a few of the components and after going back and adjusting them, we’re just about done. He’s out of town this week for business, but says that he’ll likely be done next weekend when he’s back. Which means I have one week to re-read through the entire book and make sure that it’s really done. I realize I’ve been calling it “done” for months now, but I want to make really-super-duper-extra sure that I’m fully done. A few different treatments for the typeface of the title and byline and we’ll be good to go. I can’t even express how excited I am about getting this done so I can finally get the book on sale. Once that happens, I’ll be blogging about my experience with the selling process, how I’ve been marketing it, and anything else I can think of that’s interesting. All the while picking up work on My Last Days, that I stopped working on back in October to finish up A Sour Chord. Everyone’s got their own unique writing setup. Everyone has what works for them and prefers to work in a certain manner. I have a unique setup, as I spend my non-writing days doing a variety of other jobs; building websites, doing tech support, doing voice recording. I’ve got a unique setup on my desk, so I thought I’d share how I work. My desk itself is a NextDesk Terra (http://www.nextdesks.com/terra), which is an adjustable height desk. With the push of a button, I can go from standing to sitting or vise versa. I tend to stand most of the day because it’s “healthier” than sitting all day. I use quotes there because it’s not fully proven to be any healthier, but I certainly feel healthier. An empty plastic container that I eat my cereal from. A 2013 model Mac Pro with an external hard drive hiding behind the monitor on the left. 24″ Dell monitor in portrait mode. This screen contains my email, task manager (Todoist) and a phone panel to accept tech support calls for my day job. My checkbox, letter opener and a roll of stamps. 30″ Apple Cinema display — with a Logitech camera on top of it, various cables under it, a Sharpie, a pen, soft cloths to clean iOS devices. Some junk that has no other home. Vitamins, because you’ve gotta be healthy! My keyboard and mouse aren’t standard Apple hardware. The keyboard is a Logitech solar powered keyboard that has the same look and feel of the Mac keyboard (with the short press keys) that I’ve had a few months now. I wanted to go wireless when I got my new computer, but Apple’s wireless keyboard doesn’t have the number pad and I found myself not able to live without that. My mouse I’ve had for what feels like decades. It’s a Logitech Performance Pro MX, and is form fitted for a right handed person. It’s probably the most comfortable and functional mouse I’ve ever owned. I have two or three of them kicking around for laptops and backups and whatnot. Both of my screens have specific sets of desktops on them that I use for various tasks. 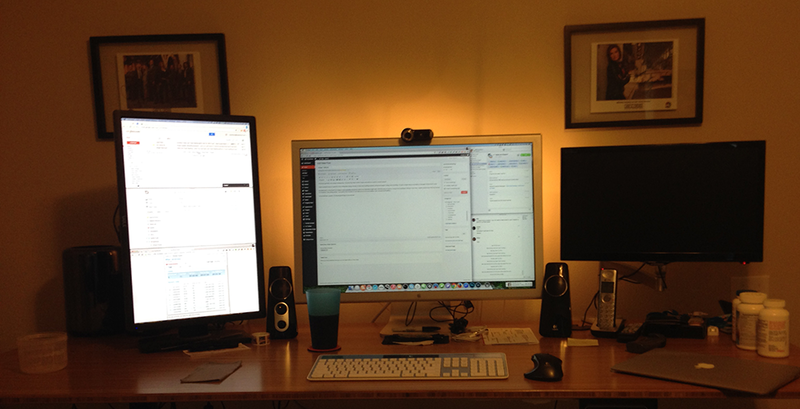 The monitor on the left is primarily the same with email, tasks, and various day-job related browser windows. The main screen varies based on the function at hand. If I’m writing, I use a specific desktop that just has Scrivener on it. If I’m doing web development, I have Coda 2, Transmit and Firefox open in a desktop by themselves. By using OS X’s built in Desktops feature, I’m able to quickly shift gears without having to hide windows, minimize things, and re-organize myself. I just change desktops and I’m ready to go. 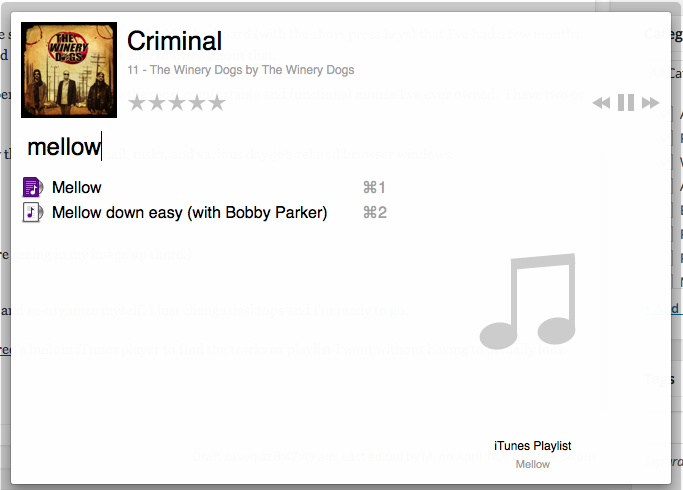 Right now, I’m listening to The Winery Dogs’ “Criminal”, but since I’ve typed in mellow, I can start my mellow playlist just by pressing enter. It saves some time in having to go into iTunes and find that playlist. When I’m writing I like to listen to music without lyrics — either classical or movie scores, as I find it distracts my brain less than if I’m listening to something where my mind might want to sing along. When I’m doing my every day tasks or working on a website I usually listen to my Rock playlist, that has thousands of songs of my favorite rock bands in it. My office is usually dark. I have curtains that block out the light and rely on the IKEA “behind TV lights” that are mounted behind my monitor for illumination. I do this specifically because of where my office is in the building. It’s on the Southeast corner, so as soon as the sun gets overhead, it beats on the corner wall all afternoon, making it a sweatbox in here. On any given warm afternoon, it’s +20 degrees from the rest of my apartment. It makes it tough to focus, so I’ve resorted to blocking out light and having a fan on during the warmer months. My hope is that once I get out of this apartment (hopefully later this year, over the summer), I’ll find a house with a separate workspace. I’d love a space over a garage so I can have my desk as well as my drums, and still be separate from the main living area. Some people think it’s a perk to be able to work from home, but it takes a certain discipline. You need to be able to separate work from home life and sometimes that’s tough. I think having a separate dwelling where I can do my “work” would help with the daily challenges of working from a home office. That’s it for how I work. I hope you enjoyed my workspace and learning about how I work on a daily basis. I’m happy to answer any questions about it, whether they’re technology questions or workflow questions. Fire away in the comments! There’s been some discussion over what the “best” music is to listen to when you write — or if you should listen to music at all. I don’t have the right answer as to whether or not you should listen to music, I can only say that I do. Though I find myself listening to things that I can completely ignore, but still enjoy. Most commonly, I listen to movie scores. Not soundtracks, as those can be distracting — I mean, how many more times can I burst into song and sing along with “Let It Go” again? — but instrumental scores from film. I’ve got an iTunes playlist that comprises of a number of scores from some of my favorite movies. The Braveheart score is one of the top played, along with Inception. The melodies inspire creativity in my feeble attempts at creating something that people will enjoy, while not distracting me from the task at hand. I’ve found that if I’m listening to something with lyrics — regardless of what those lyrics are — I get distracted. My brain can’t ignore the lyrics and I find myself singing along, not getting anything done as I should be. What’s right for you to write with is up to you, when the cards fall. There’s no right or wrong thing. Whatever inspires you, whatever helps you be creative, and whatever makes your brain fire on the right cylinders — that’s what’s right for you. The independent writing community is amazing. Over the last week, I’ve spent a good amount of time being social. Not in real life, but on Twitter. During the week, I’ve learned one very important thing: the independent writing community is fully of amazing, wonderful, and supportive people. No one’s judging you for wanting to write a book. No one’s trying to pressure you into doing what they did and had luck with. Everyone’s just supportive of one another — offering advice, friendship, asking questions. It’s been a great experience. I’m extremely happy with the folks I’ve met through Twitter in the last week. If you’re following me there, thanks! As for the book – I think I’m done. I ran through all of Lauren’s edits and finished a week ago. I then spent hours reading the book as it was, with all of the edits and re-writes and changes, to make sure that I still liked it. That when I get to the end, I still felt the same way that I felt when I read it the first time. All in all, it’s been a pretty inspired week. Seeing the “final” pages on my iPad and being able to flip through them has been pretty great. It’s no secret that I was really losing interest in this quest back towards the end of last year when everything sort of came to a screeching halt, but I can honestly say that I’m reinvigorated now by everything that’s happened. I don’t care if I don’t make any money selling the book — hell, I may even give it away for a while, at first — I just want people to read it. Though, to be honest, I’m terrified that I’m going to lose my mind at the first negative review I see on Amazon. I suppose I’ll have to mentally prepare myself for that moment. The progress continues and I’m inching closer and closer to having this thing be done and on digital shelves through Amazon, iTunes and Barnes & Noble soon. Total days elapsed since I started writing: 353.